The magician picks up a little ball, conceals it, and after waving a magic wand, it mysteriously disappears – only to reappear under a cup that has been in full view the entire time. You watch, fully understanding that objects cannot simply materialise from thin air. Yet this is exactly what you have just experienced: the impossible. Magic is one of the oldest forms of entertainment, and for thousands of years conjurors have used sleight of hand (such as the ‘cups and balls’) and other forms of deception to manipulate your conscious experience. Magic deals with some of the most fundamental psychological and philosophical questions – consciousness, deception, free will, beliefs, and so on. Yet it has received far less academic attention than most other art forms. However, during the last two decades, scientists have begun taking a keen interest in understanding the mechanisms that underpin these mysterious experiences. In doing so, we may gain new insights into how the mind works. Whilst magicians are less concerned with understanding the inner anatomy of the mind, their real-world experience in developing magic tricks has helped them identify profound errors in human cognition. Indeed, most magic tricks rely on exploiting surprising and powerful cognitive errors, and magicians have informally learnt to understand psychological principles that push our perceptual and cognitive processes to their breaking points. Many of our pioneers in psychology, such as Alfred Binet, had a keen interest in studying magic (Thomas et al., 2016). During the early days of psychology, philosophers and psychologists studied magic to further their understanding of perception, consciousness, and even free will (Dessoir, 1893; Triplett, 1900). However, after this brief flurry of interest, the scientific study of conjuring lay largely dormant. Until, that is, the last decade or so: there has been an exponential increase in the number of published scientific studies that focus on performance magic, and an interdisciplinary group of scientists from across the world are using magic to investigate a broad range of psychological mechanisms (Kuhn et al., 2016; see also https://scienceofmagicassoc.org/home#research). In the MAGIC (Mind Attention and General Illusory Cognition) lab at Goldsmiths, we have scientifically studied magic tricks to explore the human mind. For example, we use cutting-edge eye-tracking technologies to investigate how magicians misdirect our attention, and this work informs us about why people fail to see things right in front of their eyes. Jeniffer Ortega studies misdirection and has demonstrated how misdirection techniques create huge gaps in our conscious experience – gaps that few of us are consciously aware off (Ortega et al., 2018). Magic works because we are typically unaware of our mind’s limitations, and most magic techniques rely on exploiting these surprising cognitive biases and limitations. Magicians don’t simply manipulate what you perceive – they manipulate your false beliefs about how much you can perceive. For example, we intuitively feel that looking is equal to seeing, and we often advise people to keep their eyes on the task. However, much of our research shows that people don’t fail to notice things simply because they are not looking in the right place; rather, they miss things because their mind is misdirected. In fact, much of our work shows that people can look directly at something, yet they still do not see it. This work has important practical implications and explains why it is so dangerous to drive whilst talking to others on a mobile phone. Even though you are looking at the cars in front of you, the phone conversation distracts your attention. And it is this mental distraction, or misdirection, that prevents you from noticing the oncoming car. Whilst magicians often manipulate what you see, many of their deceptive techniques deal with non-perceptual mental processes, and these mind hacks provide intriguing insights into cognition. For example, ‘forcing’ is a technique by which magicians manipulate your choice, such as influencing you to pick a particular playing card. The magician might ask you to pick or think of a card, and whilst you experience this choice to be entirely free, the magician actually forced you to choose that particular card. Forcing is central to many magic tricks, and over the centuries, magicians have developed a wide range of these powerful, and often intriguing, mind-control techniques. Jay Olson at McGill University has shown that some of these forcing techniques are extremely effective at manipulating people’s decisions without them noticing how their thoughts have been influenced (Olson et al., 2015). Alice Pailhes, a PhD student in the MAGIC lab, studies the psychological mechanisms that underpin a wide range of forcing techniques, because insights into this form of mind control can provide new insight into our sense of free will. For example, Alice recently completed a study in which she used simple gestures and hand movements, based on a forcing technique developed by Derren Brown, to covertly influence the card a person chose. She simply used her hands to mime a diamond shape, and drew an imaginary figure three in the air, whilst asking a volunteer to think of a card. Fifteen per cent of the participants chose the three of diamonds, much higher than expected by chance with a 52-card deck. Some of the magician’s forcing principles share similarities with subliminal perception, a process by which your thought can be influenced by unconscious primes. However, most of the reported psychological effects of unconscious priming are very small, or fail to replicate. The magician’s forcing techniques are surprisingly effective and therefore provide a unique tool to study unconscious mind control. Our sense of free will may in itself be a compelling illusion. Other researchers in the MAGIC lab use magic tricks to study how different deceptive principles influence the way we think. The Theory of False Solutions is a misdirection principle through which magicians manipulate your decision-making process, and the results from studying this phenomenon have highlighted surprising ways in which misinformation influences our thoughts. Consider magic tricks in which magicians give their audiences a potential, yet false, solution to the trick. After a few moments, the magician demonstrates that this solution is in fact wrong. These tricks are sometimes also known as ‘sucker tricks’, and Tommy Cooper performed them masterfully. Cyril Thomas and I tested this misdirection principle in a scientific experiment in which Cyril performed a very simple magic trick in which a playing card magically travelled from a deck of playing card to his back pocket (Thomas et al., 2018). Some of the participants were exposed to a false solution (the magicians palmed a card), which was later shown to be false (the magician showed his hand empty). Our results showed that the false solution ‘fixed’ people’s mind and prevented them from exploring alternatives: a phenomenon also known as the Einstellungs Effect. Our findings have important implications for the way we process and think about information in our daily lives. We are continually exposed to false information, and it is often difficult to distinguish between real and fake news. Our results carry the rather worrying implication that even false ideas that we know to be impossible could affect our reasoning capacity and prevent us from discovering the truth. 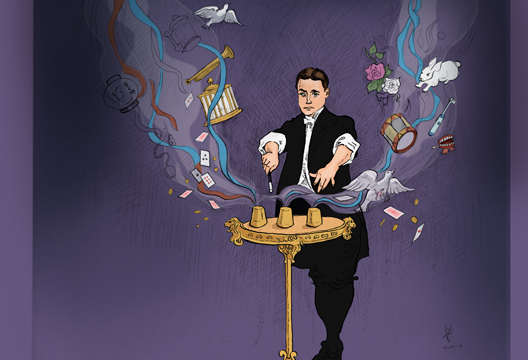 Throughout history magicians have pushed at the boundaries of what we believe to be possible. Ancient Egyptian priests used conjuring tricks to create the illusion of communicating with deities; Victorian spiritualists staged séances that fuelled beliefs in the spiritual underworld; and more recently, magicians have helped perpetuate beliefs in psychic powers. Most magicians do not intentionally aim to misinform the public, and throughout history magicians have often helped uncover spiritualists’ fraudulent claims. Magicians are honest about their deception and typically tell the audience that what they are seeing are simply tricks. The label ‘entertainment magician’ implies that what you are seeing is not real. However, research shows that knowing that they are witnessing a magic trick may not necessarily be enough to protect people from the misinformation in a performance. Indeed, in the MAGIC lab we have used magic as a tool to investigate how such misinformation influences people’s beliefs. Over the last five years we have used conjuring techniques to stage anomalous experiences in our lecture theatre, and we investigate the impact of these magic demonstrations on people’s beliefs. We do this by staging a spiritualist mind-reading demonstration (Lesaffre et al., 2018). As part of the experiment I introduce the class to a psychic medium, who in reality is one of my magician friends. We use multiple layers of deception to stage a spiritualist demonstration in which he convincingly pretends to read people’s minds and reveal information about a dead relative. We have performed these types of experiments on nearly 1500 students, and I have been astonished by students’ willingness to accept the demonstration as being achieved through genuine psychic powers, rather than trickery. All of our participants were highly educated individuals, and yet many of them were perfectly willing to accept scientifically impossible claims. What is even more worrying is that people endorse these beliefs regardless of what they were told beforehand. In some of our experiments students were told beforehand that the performer was a magician, rather than a ‘true psychic’. Despite knowing it was trickery, there was virtually no impact on people’s beliefs, with many still claiming that the phenomena were achieved through genuine psychic powers. We have found very similar results when magicians perform magic tricks that rely on pseudo-psychological principles. In the past, magicians claimed to read your mind by contacting spirits; today they use the same tricks, but they claim to use unconscious primes, body language, or micro-expressions to read or influence your thoughts. Derren Brown is one of UK’s most successful magicians, and has developed a form of magic that blends trickery with psychology. He proclaims that his performances work because he uses ‘Mind Control’. For example, in one performance piece, Derren Brown claims to use unconscious primes to control an individual’s mind, which enables him to predict with extremely high certainty, a ‘freely’ chosen object by this individual. This explanation, however, is the ‘packaging’ of the story he tells. Derren Brown uses conventional conjuring techniques to demonstrate scientifically implausible psychological phenomena or to exaggerate the effects of plausible phenomena. However, we have recently shown that these types of magic demonstrations profoundly impact people’s beliefs about the nature of psychology. In our recently published study, a magician, Yuxuan Lan, asked a volunteer to hold a coin in one hand without letting Yuxuan know which hand it was in. He then proceeded to read the volunteer’s body language and claimed to be using psychological profiling to deduce the hand that held the coin. None of these psychological principles are possible, and instead Yuxuan used a secret conjuring method which guaranteed he knew which hand was holding the coin. Before and after this demonstration, we measured people’s beliefs in what Yuxuan claimed, and our results were rather surprising. Witnessing this magic performance significantly enhanced people’s beliefs in these pseudo-scientific principles, and this change in belief was independent of whether the participants were told the performer was a magician or a psychologist. Again, these results demonstrate how people ignore warnings about the inauthentic evidence they encounter. Whilst most magicians do not intentionally aim to misinform the public, these types of magic performances can have a significant impact on perpetuating false beliefs about psychology. People rarely think of magic as a way to enhance wellbeing, but such applications do exist and are, in fact, growing rapidly in popularity. Until now, this endeavour has involved a rather disparate group of techniques, but Steve Bagienski and I have recently developed a hierarchical framework to help organise many of these approaches. Our fascination with magic, and the wonder it elicits, may connect to a deep-rooted curiosity that encourages us to keep learning. I believe that we are captivated by an apparently impossible event because it pushes us away from the mundane knowledge that we have already mastered and toward the unknown, thereby serving an adaptive function in helping us to expand our knowledge of the world. This starts early: young infants typically look much longer at events that violate their understanding of the world. Might it be possible to harness this expansive interest to boost creativity? There is evidence that experiencing magic encourages people to explore things from new angles. In one such study, children watched movie clips from a Harry Potter film that either did or did not contain strong magical content (Subbotsky et al., 2010). Immediately after watching these clips, the children completed several standard creativity tests. Those who had watched the clips with the magical content were significantly more creative than those who had not. Because seeing a magic trick triggers a strong need to know how the trick was done, this need can also be harnessed to enhance learning. For example, Matt Pritchard performs magic in schools across the UK with a specially designed magic show that encourages children to learn about science. He does this by performing relatively simple science magic tricks, after which he asks the kids how the tricks were done. Our intrinsic need to work out tricks is a natural way to get children thinking more critically and to encourage scientific thinking in a fun and engaging environment. In addition, magic is simply fun, and Matt’s magic shows put children in a better mood, which probably helps them learn more efficiently as well. Watching magic tricks has also been shown to help manage pain and anxiety. For example, Gionatan Labrocca and Edda Oliva Piacentini used magic tricks to distract children before having their blood taken, which significantly reduced the amount of pain the children experienced. In one of my favourite studies, researchers led by Laura Vagnoli recruited a group of clowns to perform magic tricks to reduce anxiety in children who were about to undergo surgery. The clowns accompanied the children and their parents into the operating room, performing tricks until the anaesthetic was applied. This use of magic did indeed reduce the children’s anxiety, but staff were concerned that the clowns interfered with the rigid medical standards of the operating room. On reflection, clowns and medicine may not have been a perfect mix. Dentists have likewise dealt with strong-willed children by performing magic tricks before sitting them down in the dental chair (Vagnoli et al., 2005). The tricks made the children more cooperative, and the researchers suggested that the magic might have helped these children perceive the dentist as a playful and approachable ally, thus reducing anxiety. There has also been a long tradition of enhancing physical and psychological wellbeing by teaching people to perform magic. For example, Breathe Magic developed a training programme to help children with hemiplegia (a neuromuscular condition that prevents people from using one side of their body). These individuals struggle to do simple bimanual tasks that we typically take for granted (e.g. tying a shoelace). Whilst physiotherapy programmes can help these children, children are typically poorly motivated to engage in these programmes, which involve repeatedly carrying out painful actions. Breathe Magic used professional magicians in collaboration with physiotherapists to design special magic tricks that encourage children to use both hands. The results were remarkable. After a two-week summer magic camp, the children significantly improved in many bimanual tasks (Green et al., 2013), and learning these magic tricks also seemed to help their self-esteem and gave them a new confidence in socialising. Teaching children how to perform magic tricks might also improve learning for students with learning difficulties. For example, Kevin Spencer developed a Hocus Focus curriculum that motivates such students by having teachers integrate the learning of magic into their lesson plans. Spencer suggests that the tricks themselves create a strong sense of curiosity and improve self-esteem by giving students skills that their non-disabled peers do not have. Teachers report that magic tricks also help students to actively engage with the content and to better develop their attention and problem-solving skills. Although more research is still needed before we can draw firm conclusions, these results are encouraging. In collaboration with Abracademy, we have been teaching magic tricks to our psychology students at Goldsmiths, and the results have been very promising. In one of our randomised controlled trials we have found that the workshops enhance the way in which students feel about themselves and help students connect with the Psychology Department and university more generally. Magic elicits powerful emotions, and understanding the nature of these experiences will hopefully help us harness these psychological principles to complement and enhance other therapeutic approaches. Steve Bagienski has recently identified and reviewed a large number of wellbeing- and education-focused magic programmes. Only a small handful of these have been empirically evaluated, and we still don’t fully understand the psychological mechanisms by which they work. Whilst applying magic is unlikely to be a magic bullet on its own, we do, however, strongly believe that it provides an immensely useful – and often neglected – tool alongside other therapeutic and pedagogical approaches. I hope that this discussion provides a small glimpse into some of the ways in which we are using magic to further the understanding our mind. A full discussion can be found in my recent book, Experiencing the Impossible: The Science of Magic. The science of magic has now become a research field in its own right and the Science of Magic Association organises a biennial conference dedicated to furthering our scientific understanding of magic. The next conference will be held in July 2019 in Chicago and will bring together psychologists (e.g. Elizabeth Loftus, Dan Simons) and world-class magicians (e.g. Mac King, Simon Aronson) to discuss scientific findings and explore ways in which magic can help answer scientific questions that go beyond simple entertainment. - Gustav Kuhn is a Reader in Psychology at Goldsmiths, University of London. Kuhn, G. (2019). Experiencing the impossible: The science of magic. Cambridge, MA: MIT Press. Binet, A. (1894). La psychologie de la prestidigitation (Vol. 125): Société de la Revue des Deux Mondes. Dessoir, M. (1893). The psychology of legerdemain. The Open Court, 12, 3599–3606. Green, D., Schertz, M., Gordon, A.M. et al. (2013). A multi-site study of functional outcomes following a themed approach to hand–arm bimanual intensive therapy for children with hemiplegia. Developmental Medicine & Child Neurology, 55(6), 527–533. Labrocca, G. & Piacentini, E.O. (2015). Efficacia dei giochi di magia sul dolore da venipuntura: Studio quasi sperimentale. Children's Nurses: Italian Journal of Pediatric Nursing Science/Infermieri dei Bambini: Giornale Italiano di Scienze Infermieristiche Pediatriche, 7(1). Spencer, K. (2012). Hocus focus: Evaluating the academic and functional benefits of integrating magic tricks in the classroom. Journal of the International Association of Special Education, 13(1), 87–99. Subbotsky, E., Hysted, C. & Jones, N. (2010). Watching films with magical content facilitates creativity in children. Perceptual and Motor Skills, 111(1), 261–277. Thomas, C., Didierjean, A., & Kuhn, G. (2018). It is magic! How impossible solutions prevent the discovery of obvious ones? Quarterly Journal of Experimental Psychology, 71(12), 2481–2487. Thomas, C., Didierjean, A. & Nicolas, S. (2016). Scientific study of magic: Binet’s pioneering approach based on observations and chronophotography. American Journal of Psychology, 129(3), 313–326.